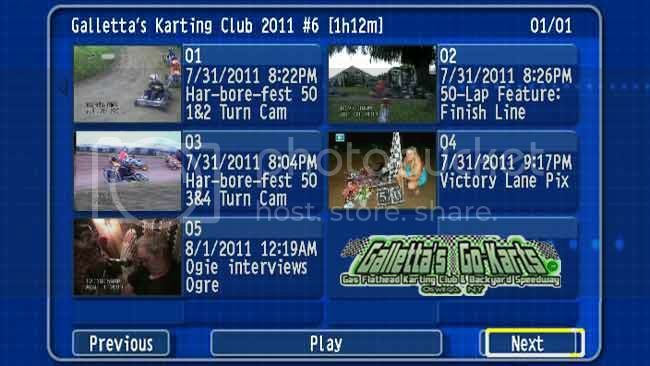 Galletta's Karting Club | Harborfest Championship Race on July 31st, 2011 - 50-Lap Race Results | The only FREE racing club in Oswego!! 7/31/2011: The Winnor of Har-bore-fest 2011 has been crowned! THE FULL RACE is now available to watch! 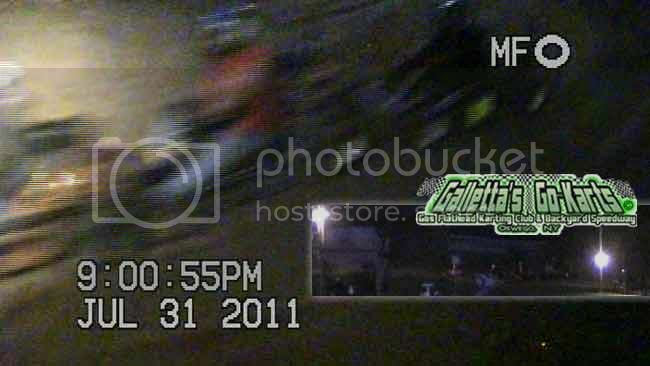 Carefully edited from two camera angles showing all 50 laps. 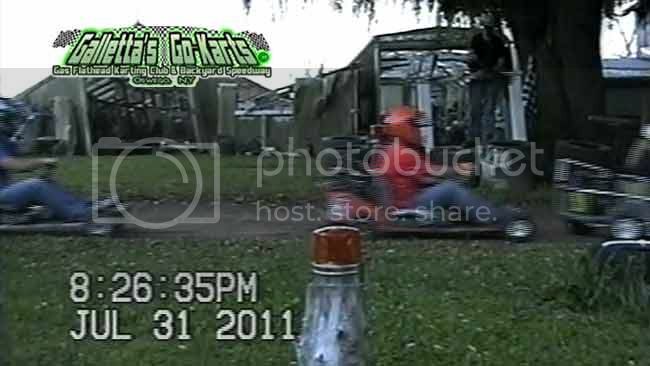 This race has a third angle from the start/finish line which is available only via DVD purchase ($5 per disc and unedited). All picture captures & video clips are directly taken from our weekly DVDs, which are almost always available to buy the day after the race. Above is this race's menu. 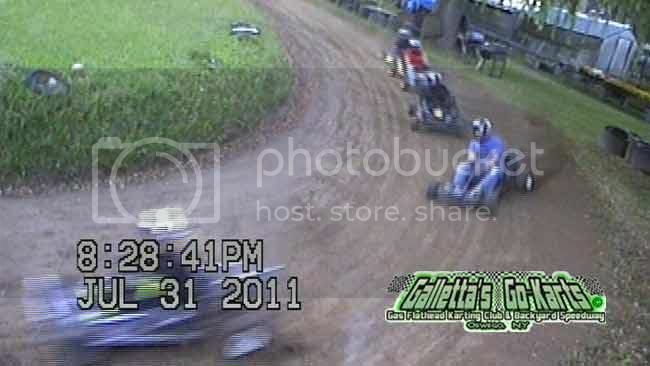 For a DVD copy of this race, please e-mail or call Chris Stevens and ask for this week's race. Each disc is chock full of between 1 to 3 hours of racing, predominantly from multiple angles and are only $5 each (discounts available for multiple copies). We accept PayPal or cash, and can either ship or arrange for pickup. AUGUST 31st, 2011: You wanna' crown someone the winner of Har-bore-fest? We crowned 'em! The only local track with enough bawls to run ran and we crowned the champion to the city's annual gigantic waste of time cluttering the city's roads because it needed a champion. And got one it did. Melissa Stevens dominated the Har-Bore-Fest 50, and embarrassed your @$$, son. Details forthcoming for your fine self, my brahs! Every year, while most of the city is involved with Harborfest madness, at the end of the festivities on Sunday evening, we still hold the Harborefest Championship Race out on our humble little big kart track in the Town of Oswego. As far as we know, we are the only local kart track of running on Harborfest, and have been doing so ever since the early 1990s, so yes, we do have the gall to call our winner the champion of Harborefest. If you have evidence of other races going on during Harborefest for as long as we have, you are welcome to debunk our claim. Wait... TWO MELISSA'S!? No, no, silly! 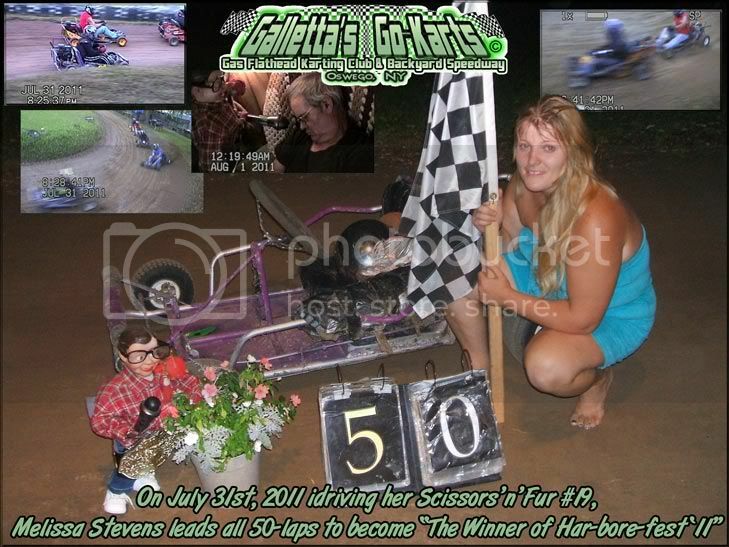 That is her husband Matt Stevens, who was challenged to race what is believed the slowest and most ill-handling Galletta-kart in the armada, the Scissors-N-Fur #80. Melissa has had trouble getting the #80 to run as well as her #19, and both spun out and fell off the track a few times last year driving it. 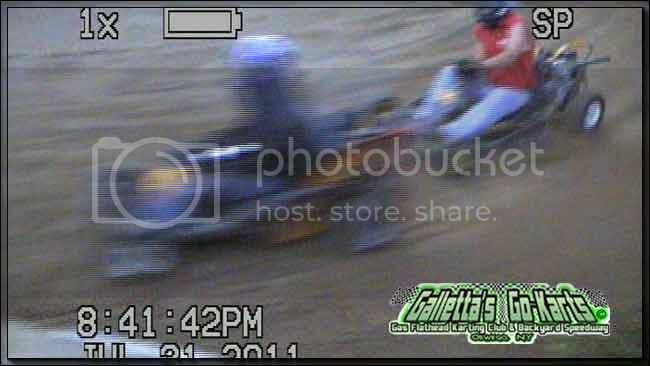 Doesn't stop that lil' crafty ol' Matt from challenging people for passes though, as here he is seen trying to get under Tim Galletta #54 and Chris Stevens (#4) early in the race. 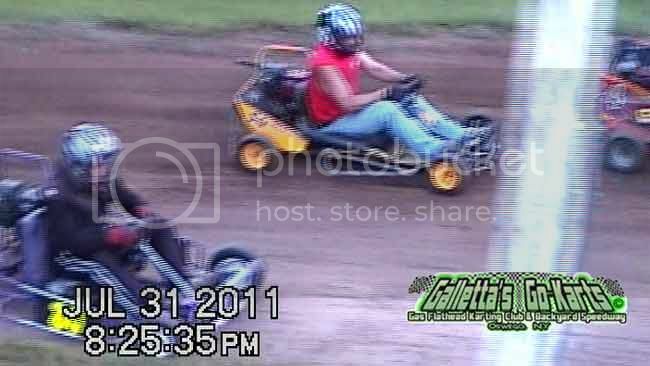 Joe Sereno started in 2nd, but spun out in turn 3 trying to pass Melissa for the lead. Look at that tricky Matty-Joe go in his wife's #80! The #80 is actually a near-identical clone to his own #33 with more nerf bars and purple paint, but they can't get it to handle as good as the original #33 that it was cloned from, which is why Matt - with a comfortable lead in the points thus far - hopped behind the wheel to test it. It has a very strong, fresh motor, just has mysterious handling issues that Matt is trying to tame. Here Melissa Stevens (#19) is seen leading the feature early. Our handicap system has been allowing tough veteran drivers to start up front because we don't have enough "new" rookies or non-winning experienced veterans returning, so today saw Melissa start on the pole. If just one non-winning veteran who has raced at least once this year showed, they would've started on the pole. 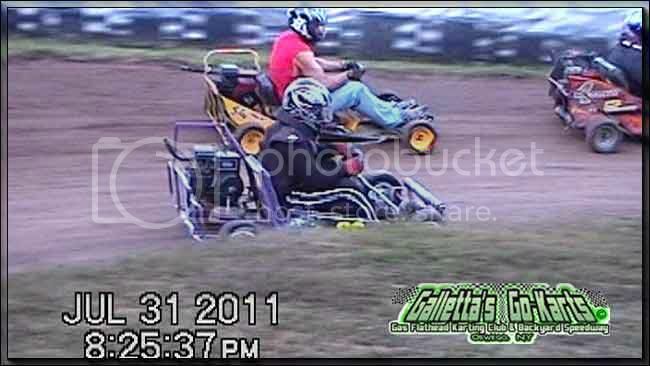 Those old vets -- you are missing some really close, fast, and clean racing action. We know that a handful retired due to age, some race part-time (but haven't raced yet this season), and some both retired and were mutually barred for their actions late last season, but we've had some good drivers in the past few years just lose interest and retire. Come on back... the racing has never been better! This upcoming weekend should net a few returning drivers, so they have told us. This weekend left a few regulars short of money for gas this week. Do not forget: WE ARE RACING FRIDAY, NOT SUNDAY THIS WEEK. Bumper-to-bumper for all 50 laps. Being so close, passes are hard to come by. Chris Stevens and Tim Galletta racing into the 2nd turn shortly after passing a loose Justin Galletta (who then got train-passed by several drivers dropping him from 2nd place to 6th in one lap after he started losing tire pressure in his right rear tire. We are THAT close, where one mistake costs you spots.). The only mishap of the night happened when the racing was SO CLOSE that Chris, Tim, and Matt all plowed like a train off it's tracks off of turn 2 and, "into the buckwheat" (as vet Fred Collins - who is semi-retired due to a lack of funds - used to say). Joe Sereno gave Matt a little help which assisted in pushing all three to go off. While the tape didn't conclude that the #9's hit wasn't the reason that forced the three off as Matt had originally believed, but enough contact was made to qualify as being part of the accident. As a result, the four all went to the back in the order that they were in when they wrecked, so essentially nobody lost their spot except Justin Galletta, who survived any entanglements, inherited 2nd place that he lost earlier in the race. Justin, who pitted to re-inflate his tire earlier in the race, lost pressure a second time, but was still able to hold off everyone else en route to Melissa's 2nd win. After the race, Ogie Stevens interviewed his twin brother Wesley "Ogre" Stevens on how he felt his flagging was. Wes was not very accomodating in the interview. At all. 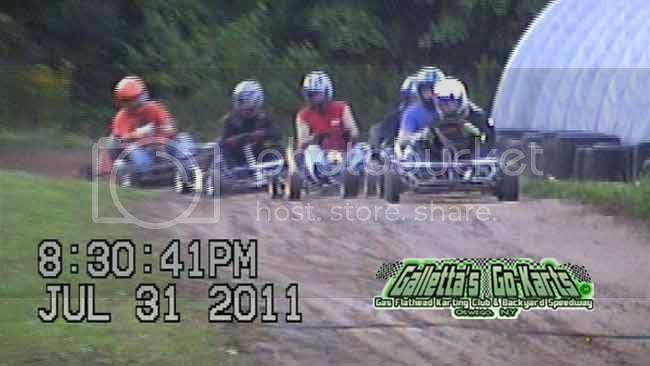 Our next race will be FRIDAY, AUGUST 5th, 2011 after all regular drivers are out of work and arrive. As for the points - are you kidding me?! We have never had a points race this close this late before. 2nd through 6th are all within 100 points aof each other, and with bonus points for those who score a lot of lead laps, 100 points can be eaten up in no time. One or two good races up front can surpass that easy. Matt still has a bit of a lead on 2nd, but it isn't insurmountable. That is... if we have enough good drivers on track to make sure that Matt has enough competition. For the Galletta's Karting Club's World Championship of 1WD Gas Flatheads held on Galletta's Greenhouse Backyard Karting Speedway for the 2011 season to date. Our complete All-Time Points Standings from 2000-to-'the-last-completed-season' are found on this webpage, and complete wins on this page.